VMware's new best friend. Tailor made for VMware environments, the HP t310 Zero Client delivers amazing processing power with the latest PCoIP technology. Gain a seamless desktop experience, even with extensive multimedia. Reduce costs and free up desk space, while increasing security. With no moving parts, reliability is part of its DNA. Get to work fast with impressive boot and response times. VMware’s new best friend. Tailor made for VMware environments, the HP t310 Zero Client delivers amazing processing power with the latest PCoIP technology. Gain a seamless desktop experience, even with extensive multimedia. Reduce costs and free up desk space, while increasing security. With no moving parts, reliability is part of its DNA. Get to work fast with impressive boot and response times. Don’t hassle with set-up. This VMware ready, PC-over-IP zero client is ready to deploy and use right out of the box. Reduce complexity with a zero client made specifically for VMware. Save time without the need to customize your fleet to VMware. You’re ready to work. Our best-performing PCoIP thin client. Finish ahead of deadlines with fast boot and response times. Forget the lags. See multimedia, online videos and 3D applications running smoothing at native frame rates. Expand your view. The HP t310 supports dual displays for multi-tasking and fine-tuning media projects. Focus IT efforts on top priorities by cutting maintenance needs on desktops. Upgrade users quickly and inexpensively by updating application software hosted on servers. Minimize the risks of your data getting into the wrong hands. 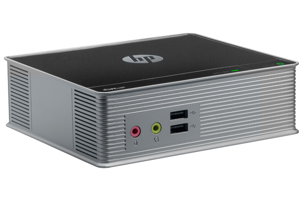 With no data stored on the HP t310, your intellectual property stays safe on the server. Boost security measures even more with the fiber network interface card (NIC). Clear clutter from your desk. The small size (5.9 in/149.8 mm x 5.2 in/132.1 mm) keeps your work area free of distractions. You stay focused. Easy setup, manageability and maintenance. Count on global service and support through a network of over 50,000 IT professionals in over 100 countries. Worry less with a standard, three-year limited hardware warranty in most regions. Choose from HP Care Pack Services to extend service contracts beyond your standard warranties.